We’ve received great feedbacks from our users since the new Scalingo Dashboard was released. Listening to what you told us, we’ve made neat improvements to the Dashboard. The app side bar received multiple enhancements to help you working with Scalingo Dashboard. You can now sort your apps by last deployment date or by name , click once for an ascendant sort, twice for descendant sort. 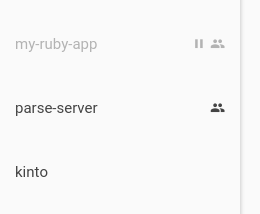 If you are working with collaborators on your apps, sometimes you might want to hide apps shared with you, it is now possible, just click the MINE button. Browsing through a long app list is tedious, so we implemented a smart filter on the app name. A few key strokes is enough to find your app quickly. You can fuzzy search through your apps by typing just few letters. Little indicators are added to help you quickly distinguish apps that are stopped and apps where you are collaborating. Apps are considered stopped when they are scaled down to 0 containers. 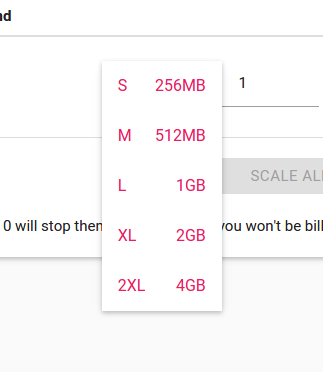 Some users told us they often don’t know the container specifications for each container size, so we added a bit more information when you are about to change your container’s size. Deployment time is made visible on each app’s deployment page and on the timeline. You can have an idea of how long time it actually takes to deploy your app. This information may give you a hint on the evolution of your app.